A laser thermometer can be used to gauge temperatures for a myriad of reasons. The five best infrared thermometers are reviewed and compared. A laser thermometer can be used for a variety of different reasons. Great for home use, industrial and outdoor use, they perform the task of reading specific temperatures. There's a varied group available, infrared thermometers being one of the most popular. They're usually pocket sized and run off batteries, though some are rechargeable. They're a useful tool for those in the auto trade, restaurant environment or for outdoor workers. They deliver a result that allows the user to make informed decisions and there isn't another tool that will perform the same task. They're the lesser version of home weather stations, in that these act as a stand alone temperature gauges. The five best laser temperature reading devices are featured below - according to their popularity, their value for money and usability and function. This is the best selling laser thermometer and beats it's competitors by a long mile. It will delivered a wide range of temperatures - from as low as minus 79 right up to 932 degrees fahrenheit. It's light and comfortable to hold, the ergonomic design lends itself to an easier operation. The screen is back-lit and the digital read out big enough to read without any real effort. The sensor is located to the front, the measuring button underneath the head and the screen displays your battery levels, the temperature and range, indicator scale and the max temperature. It uses two AAA batteries, the response time is astonishingly fast and it's safe to use in all industrial environments. 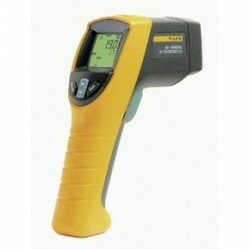 A cracking infrared thermometer and the best all round buy on the market. The Fluke is the best mini laser thermometer and in it's class, offers the most accurate results. It's perfect for any industrial environment - home and commercial heating, restaurants and health and hygiene, and is compact and robust in the hand. The temperature range is between minus 20º and 360º fahrenheit. It is accurate to within 1% from up to 6ft away from its target and holds the same accuracy both outdoors and in. The design adds to it's comfort and it comes complete with a pouch that attaches to the belt. It will display the read out for seven seconds, offering plenty of time to jot down the data. This is a superb example of laser technology and its current price makes it an affordable investment. This is the best pocket laser thermometer and even better - it's waterproof. It's small, sleek and incredibly compact and though the screen is pretty small, it's readable and does the job. It possesses a spot to distance ratio of 1 : 1 and once pointed at its target, it will return the data in under one second. It can accurately measure a moving target, liquids, solid objects and more. The temperature ranges from minus 47º up to 478º fahrenheit. It's the infrared thermometer of choice for many that work in the auto industry and food and catering industries and for its size, it packs a lot of punch. An awesome little unit, inexpensive, accurate, pocket sized - what more can you want? This is a great combo laser thermometer - it also comes with a free analog temperature gauge that's extremely useful for the food industry. It feel comfortable when you're using it and the returned data is rapid. It has a range of minus 40 up to 931 degrees fahrenheit and it display both maximum and minimum temperatures. It's good a good, robust construction and the screen is large enough to read the data comfortably. It can be used for a multitude of temperature gauging tasks - food checks, home temperatures, wine cellars, auto and commercial heating, to name a few. Both the laser and analog thermometers are house in their own hard cases and its well worth the current price tag. 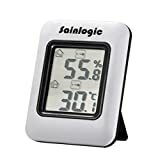 This unit is the best industrial thermometer and is purchased by those that need an infrared thermometer that can cope with the full range of tasks expected of a pro use model. It reads temperatures between minus 40 and 1022 degrees fahrenheit and is incredibly lightweight at only 12 oz. It's fully capable of standing up to the type of wear and tear that occurs with regular professional use and the emissivity is easily altered s that it reads ducts and pipework with superb accuracy. The screen is big enough to be breeze to read, the overall design built around a comfortable grip and it scans both small and large areas in a rapid fashion. For those looking for an industry standard thermometer, the Fluke 561 is the best there is. An incredibly versatile, user friendly thermometer and well worth the investment.